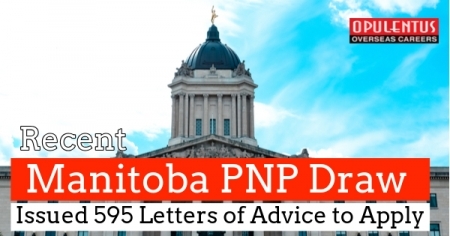 In the recent Provincial Nominee Program of Manitoba draw conducted on Mar 28, the province granted Letters of Advice to Apply (L.A.As) to approximately 600 applicants. Out of these, 262 Letters of Advice to Apply were declared through the stream Skilled Workers In Manitoba. The demanded lowest score was 433 points. International workers with an expected skills level can appeal for provincial nomination for PR in Canada below the Skilled Worker in Manitoba Stream. Applicants with a close relationship to the province will receive more preference. The stream has a couple of pathways– Employer Direct Recruitment Pathway and Manitoba Work Experience Pathway. Another 260 Letters of Advice to Apply were announced to applicants of the Skilled Workers Overseas stream belonging to the Human Capital Pathway. They were expected to have the least score of a minimum of 563. The Stream Skilled Worker Overseas has both a committed Federal Express Entry Pathway and a straight provincial pathway called Pathway Human Capital. International workers with experience and skills in one of the In-Demand Professions of Manitoba province are able to apply. Manitoba announced yet another 44 L.A.As to applicants belonging to the Manitoba PNP's International Education Stream. Foreign graduates from Manitobian colleges and institutes can appeal for provincial nomination by the International Education Stream. The International Education stream does not need work experience of 06 months. This stream has 03 pathways–Student Entrepreneur Pathway, Career Employment Pathway, and Graduate Internship Pathway. Besides, 29 applicants received LAAs by the Strategic Recruitment Initiative. The weakest demanded score was 719 points. The draw held on Mar 28 was the 62nd draw in the Manitoba PNP history. In the early draw conducted on Mar 14, Manitoba had declared 274 Letters of Advice to Apply to Pathway of Human Capital aspirants with the 564 points lowest score. The Strategic Recruitment Initiative announced another 63 LAAs, the minimum required score is 695 points.